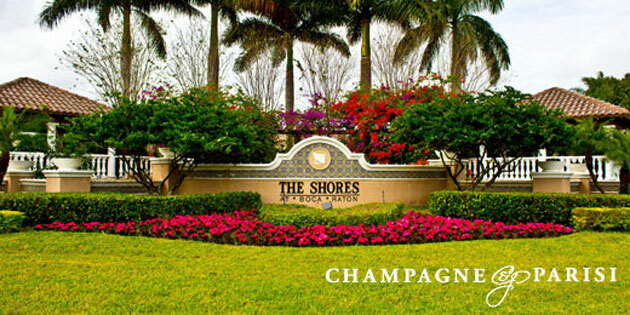 The Shores at Boca Raton is an exclusive gated community located in the heart of West Boca. As one drives through the elegant gate and into the community, he will notice lush tropical landscape all around, with a multitude of glistening lakes and colorful plantings immediately capturing his view. This beautiful scenery truly creates a heavenly feeling of being lost in paradise. The Shores is a private neighborhood that was developed in the mid 1990's by Kenco Communities. Of the 330 single family homes built in The Shores, one can choose from 10 different styles of residences, each ranging from either one or two stories. These lovely homes span in size from 2,200 square feet to just over 3,500 square feet, and they feature 3 to 5 bedroom floor plans. Many of the residences in The Shores have been completely renovated and now contain upscale features. To list a few of these outstanding perks that these houses offer, one could cook in gourmet kitchens, enjoy spacious patios, or even indulge in private swimming pools. Obviously, these homes also offer breathtaking views of the area's natural beauty, consisting of wondrously green foliage and tranquil, sparkling lakes. Residents in this neighborhood take great pride in the maintenance of their perfectly manicured lawns and elegantly designed homes, as well as in the terrific atmosphere that is so prevalent throughout the community itself. Similar gated communities which are close by and feature comparable homes are Saturnia, Boca Isles South and Boca Isles North. Some of the amazing amenities at The Shores begin with only a simple right-hand turn after the guard gate, taking one into the parking lot of the gorgeous Shores Clubhouse. Here, families can swim in the resort-style pool, relax in the spa, or play around in the tot lot. Additionally, the clubhouse features a state-of-the-art Fitness Center, a Kids' Club, four tennis courts, and a newly-renovated basketball court for those inclined to shoot some hoops. As if that was not enough, The Burt Aaronson South County Regional Park is located literally right across the street. In addition to the baseball, lacrosse, and soccer fields, as well as basketball and tennis courts, beach volleyball areas, a public golf course, a dog park, and the amazing scenery, the Park features live theater and music events inside of the brand new Sunset Cove Amphitheater, which is truly a blessing. Another perk of The Shores at Boca Raton is its practical location. Being zoned for some of the best schools in Palm Beach County, The Shores is a wonderful place for children of all ages; Sunrise Park Elementary School, Eagles Landing Middle School, and Olympic Heights High School are all very successful schools, and all are conveniently within a very short driving distance. Also, the community is situated a mere 15 minutes away from Florida's Turnpike and I-95, thus providing easy access to other cities such West Palm Beach, Ft. Lauderdale, or even Miami. In addition, The Shores is located near some of the best dining, shopping, and recreational activities that Boca has to offer, giving its residents copious choices for how to spend their leisure hours. All in all, living in The Shores at Boca Raton genuinely offers homeowners the best of both worlds: While being surrounded in peaceful and natural beauty, residents are merely just miles away from the city's most popular locations and entertainment. The Shores at Boca is truly one of the area's most valuable wonders.